The redesigned 2020 Land Rover Range Rover Evoque is rated at 23 mpg combined, but some of its rivals are thriftier. EPA fuel economy estimates released earlier this month rate the 2020 Range Rover Evoque at 20 mpg city, 27 highway, and 23 combined. A 2.0-liter turbo-4 engine powers the luxury SUV and it's paired with a 9-speed automatic transmission. Four-wheel drive ensures power makes its way to the pavement and the Range Rover Evoque includes the latest Terrain Select 2 system to simulate torque vectoring and "lock" the rear wheels on loose surfaces like sand. 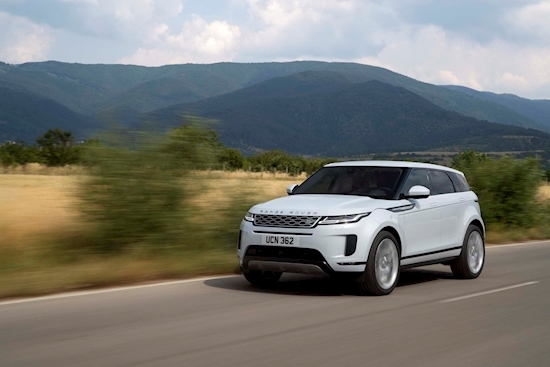 Unlike the previous Range Rover Evoque, Land Rover will now offer a mild-hybrid version. The SUV gains a 48-volt mild hybrid system that can help save fuel at speeds under 11 mph. Curiously, the mild-hybrid system returns the same combined fuel economy rating as the regular powertrain at 23 mpg combined. City fuel economy increases to 21 mpg, but highway driving nets 26 mpg—one mpg less than the standard powertrain. The 23 mpg combined figure matches the Mercedes-Benz GLC Coupe. The Benz is estimated to net 21 mpg city, however. On the other hand, the Range Rover Evoque doesn't keep up with the BMW X4's 22/29/25 mpg ratings. Within Land Rover's own vehicle portfolio, the Range Rover Evoque is slightly more efficient than the Discovery Sport, which nets a 21/25/22 mpg rating from the federal government.